Can you find "American Sickness" in the laboratory? I just finished reading "An American Sickness" by Dr. Elisabeth Rosenthal. While I have been accustomed to reading about the problems of US healthcare in books, this particular volume was particularly shocking. Dr. Rosenthal didn't pull any punches - it made me believe that there are no easy answers to the problem of US healthcare, and that there are no hard answers either. There are only painful, seismic, near-impossible answers to the US healthcare system. And given the current weak tea of both the Affordable Health Care Act ("Obamacare") or the American Health Care Act ("Trumpcare") do not show any political courage required to tackle the root causes of our problems. Dr. Rosenthal starts her book with a set of "economic [mis-]rules of the dysfunctional medical market"
There is no free choice. Patients are stuck. And they're stuck buying American. More competitors vying for business doesn't mean better prices; it can drive prices up, not down. Economies of scale don't translate to lower prices. With their market power, big providers can simply demand more. There are no standards for billing. There's money to be made in billing for anything and everything. Dr. Rosenthal convincingly demonstrates that all of these rules are true for American healthcare. As I read this list, I wondered, "How many of these rules are true for laboratory medicine"? Certainly, for some rules, laboratory medicine is no better off than other areas of healthcare. But there are notable differences: the price increases rampant in other medical fields have not been so terrible in laboratory medicine. Laboratory medicine is one of the few areas where prices have been managed and costs haven't increased as fast. (There are those in the laboratory who feel we have been short-changed, who feel continually targeted for cuts while other fields and departments see unchecked spending). I'm curious to know what others think: Are all ten mis-rules applicable to laboratory medicine? Or just one or two? "[A CHEM-7] is a single test performed simultaneously on one red-topped tube. When I most recently checked in my area, the commercial labs were charging $17.25 to $22.69 for an electrolyte panel. But on hospital chargemasters the same single is now often billed as seven separate tests - about $50 to $70 apiece, for a total of $350 to $490." I'm a bit late in calling attention to this, but the latest edition of Contemporary Practice in Clinical Chemistry has a chapter on method validation and verification that I co-authored along with Dr. Dave Koch, the Past President of AACC. For a short one chapter discussion of method validation and verification, this is the current best choice. This is one of those thoroughly comprehensive textbooks and for AACC members it's available at a substantial discount. Pop Quiz: what's the error rate of diagnosis in US healthcare? Can you guess just how bad US healthcare is at making the right diagnosis? We were supported in this effort by QuaLab, who arranged for the translation, and by Dr. Rengfeng Feng, who verified the translation. Dr. Feng has been a "surrogate Westgard" in China for decades, advocating for better quality in laboratories using Westgard tools and techniques back when it was difficult for us to travel there. Even now, as we visit more often, we certainly can't be everywhere, and we are glad to know that thousands of laboratory professionals will have access to this valuable resource. Thanks again to the Nanjing conference organizers, QuaLab and Dr. Feng! Dr. Gabriel Migliarino poses with the Westgards in Chicago. Dr. Migliarino provided the last and longest chapter in the new book on Basic Quality Management Systems. This book is designed to help laboratories navigate their quality to the next level. Beyond mere compliance, there is a higher level of operation, that of the quality system. Laboratories outside the US are more familiar with this, and many are already required to achieve ISO 15189 accreditation. For laboratories inside the US, making the leap to quality systems and/or ISO 15189 accreditation is a competitive step. In the future, the labs with quality systems will have operational advantages over those that don't. We had the honor of participating (in a small way) in a recent program called SLMTA (Strengthening Laboratory Management Towards Accreditation) in Cape Town, South Africa. Through the guidance of Anna M. Murphy MLS(ASCP), participants from over 14 countries were trained in Basic Quality Control and Basic Method Validation. Through the generosity of Roche Diagnostics, each participant was given a copy of Basic QC Practices, 3rd Edition and Basic Method Validation, 3rd Edition. Part of their parting responsibilities were to study these reference works and advocate to their respective Ministries of Health to include and require these skills in laboratory management and accreditation. Our thanks to Anna Murphy for including our materials in her training, and also to Roche Diagnostics for supporting this important project. Closing the gap in quality between the "developing" and "developed" world isn't easy, and will require the charitable efforts of diagnostic companies. In the run-up to the AACC/ASCLS conference in Los Angeles, you may have seen a notice about a free book giveaway. For the first 150 people to come to the SeraCare booth at the Laboratory Exposition, they would receive a free book of their choice (from among the three possible titles: Basic QC Practices, Basic Method Validation, and Six Sigma Risk Analysis). We expected the event to last the entire day. Do you want to guess how long it actually took before all the books were gone? More than 250 years ago, Founding Father Benjamin Franklin published "Poor's Richard's Almanack," a compilation of practical tips and words to the wise. His bestselling book spoke to the growing spirit of self-reliance and independence in America. 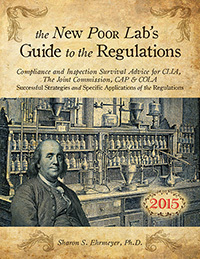 Continuing in this tradition, the Poor Lab's Guide is an essential collection of pragmatic wisdom for the American laboratory. Save $15 off the cost of this manual with the online coupon: LABFREEDOM. Order at http://www.westgard.com/the-poor-labs-guide.htm store before July 31st to take advantage of this discount.